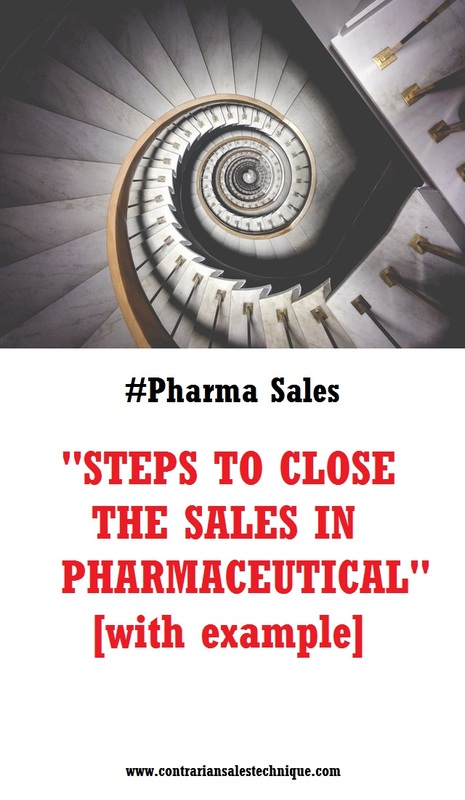 In pharma selling, you'll notice that how to close the sale is a very crucial part of the overall pharmaceutical selling skills. In this post, you'll get to know about 4 steps to closing, and types of commitment you could ask for. You probably find this as one of the best sales closing techniques, complete with example, and it does cover what most doctors expect from medical sales reps. When you succeed with one product, you can move on to your next product, if you're selling more than one products. In today's typical medical sales jobs, you often find yourself with multiple products portfolio. That's just how things are going in pharmaceutical sales. 'Closing' here means 'asking for commitment'. One important factor to look out for when you want to bring a sales call to a close is TIMING. Asking at the right time is important and the question now is, "How do you tell that it is the right time?" You know it is the right time through a subtle action called 'checking for receptivity'. These three things are pre-requisite to close the sale in pharmaceuticals. You'll be learning all these as part of your pharmaceutical selling skills and they are probably the most 'drilled' skills when you take up medical sales jobs. Naturally, you'll find that many doctors have their own opinion and preference when dealing with what you're presenting to them. You need to manage that. If you can manage it, then you use trial close again. You repeat this until you can bring yourself to a sales close. Be mindful that doctors expect medical sales reps to treat them like human. Put yourself in their shoes for that particular moment and ask yourself, "Am I doing this as humanly as possible?" Let's take a look at a simplified example of each step. "In view of Drug X effectiveness in reducing blood pressure - especially in elderly patients, excellent side effect profile, low maintenance dosing and greater compliance..."
Highlight the affirmative which reinforce their receptivity and prepare them to 'Yes'. "I'd like to ask you then, Dr, when you see an elderly patient who you think is a suitable candidate for a Drug Z, would you be willing to try Drug X for that patient?" When you ask for doctor's Commitment, you want to be specific, results- oriented and realistic. You want your doctor to do something. For example, asking if you could leave samples is not a result-oriented commitment. "Thanks DR. I think you'll be pleased with the results." "I'll leave enough samples for several patients. You should start patients on 5 mg once-daily and then give Drug X some time, since it has gradual onset of action. You'll see maximum results in about 4 weeks." If you have read this far, you now have the idea on how to close the sale in pharmaceuticals. This is one of 9 pharmaceutical selling skills that is required of you to carry out your medical sales job. If you want to succeed with pharma selling, then, like what you've read before, meet what doctors expect from medical sales reps combine with lots of human touch.